Ok your going to love this one . I have a number of decware amps , a toriimkiii, 2 zen selects a black one and a white one, and a zen se84c+. I have a small room 9x13 . oh and until yesterday a TS mini beast ,(had to find out what OTL was all about). Well I find myself going back to the se84c+ constantly. using the zcd200i exclusively. in the case of the torii, I think its just too big sounding for the room . Im using the most revealing speakers I could build for the buck. common sense super 8's in 2.8 cabinets . Read though the decware 8's are the way to go. (Will the deware 8's have same bolt holes as common sense super 8's???) Anyway since my se84c+ was in a fire that destroyed my house almost a year ago, and sounds so great . i think I'll be purchasing another one . Chassis got beat up by the fire....... but not the sound!!!!!!! Odd that you would prefer the ZEN over the SELECT. Riverranch its an 018sn white select that was at decware for a going over . the zen is , or was brand new 1054sn just months before the fire . is a select that much better than the zen? or supposed to be . I bought the white select used . should not matter,its the newer model . ??????????? I hope to audition a ZEN, a SELECT and the ZEN MONOBLOCKS one day. It is basically the same ZEN circuit, with the SELECT being slightly modified and the MONOBLOCKS representing the end point of the ZEN design, with tube regulation. yes me too with the monoblocks. hope to make decfest this year. its like the common sense audio drivers , i have the super 8's ,are the super 8's alnico three times better than the regular super 8's , well they are three times the price. don't think so!!!!!!!!! "are the super 8's alnico three times better than the regular super 8's"
The Alnico Super 15 are certainly much "better" than the ceramic version. Two and half times better? I'm not sure.... But big difference (especially in the bass) none the less. The TABOO is out of rotation right now. I did use it extensively with the CSP2 preamp. to Kevin ,what cainets do you have them in? and the bass is better. well i dont doubt that. I've had super cast 10 in 2.8 for awhile and was thrilled with them until I put super8's in 2.8s....... and of course the zen in its various forms makes it all happen. Riverranch so your telling me the taboo is outdone by the mini torii..... maybe the taboo can be converted to a select , since your not using it. i have my select in the system now and . i may retract my thought on going back to the regular zen . dont know what Steves thoughts are on this . I say its a compromise once again. probably the taboo is just a matter of changing it to triode. have you heard a zen in your system ?may not have the power you need but man it maybe more magical than anything out there. being 58 years old may be wearing on my ears . but these amps are veeeery special. Just wanted to add that after buying and selling a lot of amps over the years, for the first time I have NO desire whatsoever for another amp anymore since the first SE84C came into my install. I've changed the inputcaps with V-vaps and placed the inputs to the front-top, eliminating the pot plus inner wire....magic. Recently I could buy another one, so now I'm running them as monos and for me it's the simply the icing on the cake. So how good is a SE84C...? VERY GOOD SIR ! I have no reason to convert my TABOO to a ZEN SELECT. I doubt it could be economically done. More than that, my TABOO has V-caps, which make the unit sound "sweet." It also has a headphone modification with a speaker cutoff switch, which allows it to be used solely as a head amp. So, Rivieraranch, how does it compare (SE84C+) with your Mini Torii? Each amp has a "hook." I think the MINI TORII's hook is the black backgrounds, high gain, extreme tube versatility and treble control. The ZEN SE84C+ has the hook of the insane imaging and holographic presentation. However, there is not as much you can do with it. I would not want to divest of either of these amps. You can drive a ZEN into distortion and enjoy it; however, the MINI TORII would be too loud before it distorts to ever try that. Interesting observations. I can follow what you're describing. I have not heard the Zen, but the Mini Torii sounds so good, I'm just curious how can anything be better, other things being equal, of course. Believe it or not, I have not yet used the treble control, as I've honestly never felt the need, so far. I've also noticed the volume seems to grow exponentially with the volume pot dial (not linearly), so that between 1:00 and 2:00 o'clock, it changes dramatically, both in SPL as well as dynamics and sheer presence. I very rarely go that high (usual range is between 11:00 & 1:00 o'clock), but when required, it sure delivers, without any apparent distortion issues. Great little amps both of them, indeed. Thanks for the feedback. Having just sold my Mini Torii and kept the SE84C+, I can say I was very surprised by the SE84 ZEN! I'd had the Torii for a few months before finding the used ZEN, and with all of the tube rolling capabilities of the Mini I thought it would win easily, but the little ZEN amp is just amazing in the imaging department. I think Riviera Ranch's earlier comparison is spot on; but for me the magic imaging of the SE84C+ wins, and freed up funds from the sale of the Mini for other projects. One day I'll probably pick up another ZEN to try out bridged mono. I don't think you can go wrong with anything from the Decware stables. The Bendix 6094 (with adapters) is one alternative to SV83 or EL-84. Interesting sound, and quite good! Only a few hours on these tubes so far, but very promising. Amazing construction! I've found EL-84 (and the 6094) don't like the 274B rectifier but sound very good with a 5U4. Never heard the C+ but am still enamored with my 10 year old Select. It recently put my girlfriend in a trance. Also, when she saw the amp she said, "it looks like some sort of machine". She never heard tube audio before - nor ever heard of tubes - but when I played some Loreena McKennit, James Taylor, and meditation music through the system, she literally stood there dumbfounded and said the proverbial "it's like they are in the room". After she sat down, I played Marina Raye's Blissful Journey and my girlfriend (who is Buddhist) crossed her legs in the chair and began to meditate. Talk about "Zen"! I've had an urge to add a bit more power to my system (either the Mono's or a Torii III) but am not sure at the moment. Not sure how they would mate with my 2 ohm Parker 95's. I was thinking of adding an HSU ULS-15 sub to add more base extension then decide after that what to do. I am open to suggestions.... I have also kept my eyes open for the older Zen Monoblocks but they don't seem to come up often for sale as in the past. A ten year old Select. Ah. . .the well-seasoned Decware amp. These amps I think get better and better the longer they're in use! Thanks for sharing the lovely photo and your girlfriend's impressions. I know you'll keep enjoying the music with this fine amp. I don't think you need to change amps. . .I bet you really don't need a bit more power. Adding a sub may be the ticket to help the Select. The SE84 amps have a magic that the others don't. . . I think you should stick with the Select until/unless you're in a situation where you need more than a little more power. If you get the HSU, please let us have your impressions. They sound like they are nice subs, and with the Parker's stopping at 55 or so, seems this would bring notable weight and depth to your system. Is the Zen loud enough otherwise in your system? Might be awesome to find another seasoned one to bridge with it. When you find a second Zen amp; BUY IT! I very much enjoyed my Zen amp for quite some time already now, driving my fully modified Klipsch La Scala's. Out of curiosity I bought the second one only a few days ago when it was up for sale local. Both units are 10 years old and like described earlier they make even more "magic" when used as mono's. It's not for the extra power; my LS have a efficiency of 104Db/1W so even a single Zen delivers more than enough power for adequate listening levels. Thanks guys! I'm leaning towards the sub and may try that first. It's supposedly a very musical sub so I don't think it's money waster. I do get some considerable volume on some material and the base extension on the Parker's is pretty respectable but based on Steve's paper on subwoofers, the sub might be the ticket to add that extra dimension. My Select is no longer stock as I had it modded by Eddie Vaughn back in '07 so I can't mate it with another vintage Select to bridge as a monoblock as there will be a component mismatch. If afterwards I feel I need more power, I may revisit either getting two SE84C+'s or the SE84ZS monos. I may also consider the Torii (whole different design i know). How would those amps fare with the 2 Ohm load of the Parker's? The SE84C+ is so good it could make a peach grow more hair; could make ice cubes without water or make a plane fly without fuel. At least that is the way I feel about it. Wow so many comments on this amp. I feel the best one is ." 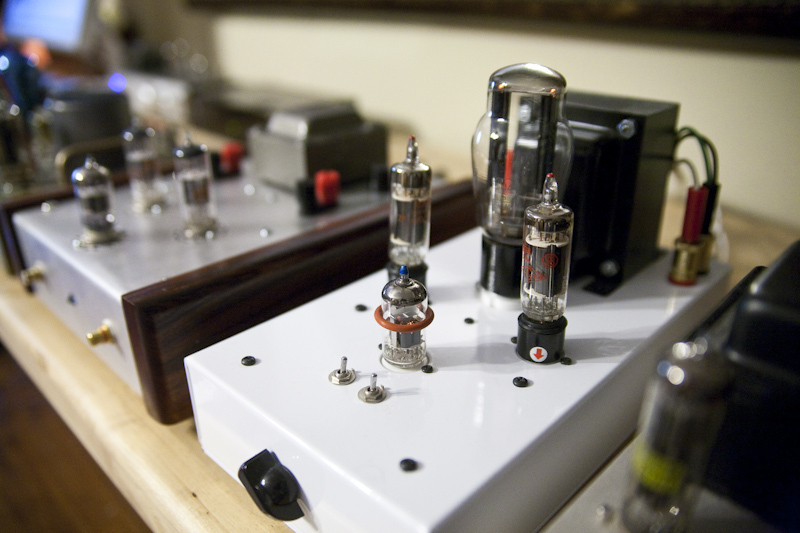 It doesnt matter which Decware amp you buy " they are all that good . I have an old select , black, serial number 249 ,which looks to have the CCE mod. Great!!! the biggest thing ive done to get an enormous amount of gain however , was to buy the ZCD200i , 5 volts output ,once broken in (which takes awhile) is as good or better than ANYTHING out there,again in a small room . If you have a large room the Torii family will do the best job. hey I'm preaching to the choir. !!!!!!!!!!!!!! !